Gov. 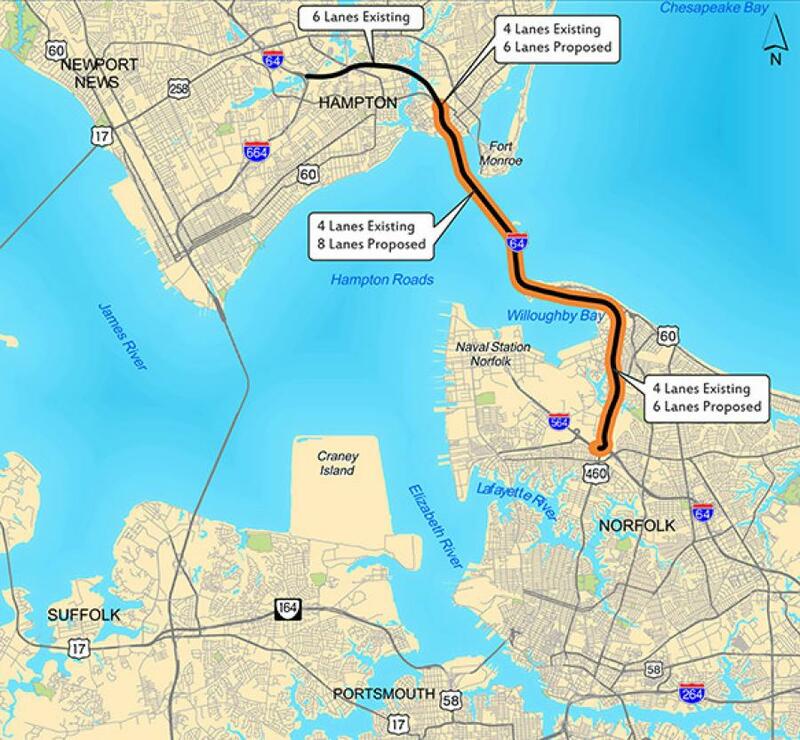 Ralph Northam announced that the Commonwealth of Virginia has selected Hampton Roads Connector Partners, a design-build team, to deliver the Hampton Roads Bridge-Tunnel (HRBT) Expansion Project. The fixed price ($3.3 billion) and fixed completion date (Nov. 1, 2025) contract is expected to be executed in April 2019. This announcement follows a yearlong competitive procurement that started in December 2017 with three qualified design-build teams. Two teams submitted comprehensive technical proposals and price bids. After detailed evaluation, the proposal submitted by Hampton Roads Connector Partners has been selected as the best value proposal based on bid price and technical score. The details of the best value evaluation will be presented to the Commonwealth Transportation Board (CTB) and the Hampton Roads Transportation Accountability Commission (HRTAC) at their respective meetings in March. The primary source of funding for the project is HRTAC, with applications for state and federal financial support in the process of being finalized. In addition, the Virginia Department of Transportation (VDOT) will fund replacement of the bridge trestles on the Norfolk side. "This project supports and expands critical transportation infrastructure, creating opportunity for families, military personnel, and businesses in the Hampton Roads region," said Northam. "I am proud of the hard work and negotiations that have taken place over this past year to deliver significant improvements that will relieve daily congestion, increase safety, and drive economic growth throughout this important corridor." "VDOT's largest transportation project is being constructed in the heart of a region vital to Virginia's economy, military readiness, and regional connectivity," said Secretary of Transportation Shannon Valentine. "This would not have happened without close coordination and strategic partnership between the Commonwealth of Virginia and HRTAC." "HRTAC's regional tax and user-supported funding, with anticipated state and federal funds, for the HRBT Expansion Project will continue to ensure future congestion relief and connectivity through regional solutions and partnership with VDOT," said HRTAC Chairman Michael Hipple. "HRTAC and the Commonwealth Transportation Board are already funding partners in the delivery of more than a billion dollars' worth of transportation projects that will enhance the quality of life and economic vitality in the Hampton Roads region." "This is a landmark day for our region and the Commonwealth. The hard-working citizens of the Hampton Roads region have asked for and deserve common-sense solutions to the traffic congestion that chokes our region," said Chairman Chris Jones. "This infrastructure investment in the Hampton Roads Bridge-Tunnel is a win-win for our families, communities, and military personnel who rely on this vital structure every day." "This announcement is the culmination of five years of hard work among all the leaders in our region," said Sen. Frank Wagner. "From the creation of HRTAC to today's announcement, we will ensure that our region's economy will continue to grow and unite our region as never before. I want to personally thank Governor Northam and his team for making this day possible." This project will add two new two-lane tunnels. It will widen the four-lane sections of Interstate 64 in Hampton between Settlers Landing Road and the Phoebus shoreline, as well as the four-lane section of I-64 in Norfolk between the Willoughby shoreline and the I-564 interchange. More than 100,000 vehicles currently use this facility during peak travel periods. "Today's announcement signals a major milestone in this generational project that will improve accessibility throughout the region," said VDOT Commissioner Stephen Brich. "VDOT is committed to collaborating with regional partners across the Commonwealth to deliver transportation solutions that work for the citizens in the communities we serve." Hampton Roads Connector Partners is a joint venture consisting of multiple partners, with Dragados USA serving as lead contractor and HDR and Mott MacDonald as lead designers. The team also includes Flatiron Constructors, Vinci Construction, and Dodin Campenon Bernard. For more information, visit www.hrbtexpansion.org.